Talking Typer is computer keyboarding and typing training software that speaks and displays lessons on screen. Includes drills, practice, and typing games. Adjustable to the student's level of skill and sight impairment. All three options noted below contain the latest version of the Talking Typer program. The only difference is the higher or lower quality of the synthetic speech. Talking Typer (with Enhanced Voicing) uses new computer voices that sound much closer to human speech. 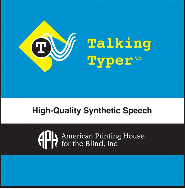 This version of Talking Typer provides a higher measure of intelligibility and less fatigue for audio users. Talking Typer Upgrade will allow you to add Enhanced Voicing to any version of Talking Typer for Windows that you currently own. The Upgrade will also upgrade your copy of the Talking Typer program, if needed.